Bob Schindelbeck is an Extension Associate in the Department of Crop and Soil Science with responsibilities in research, teaching and extension. 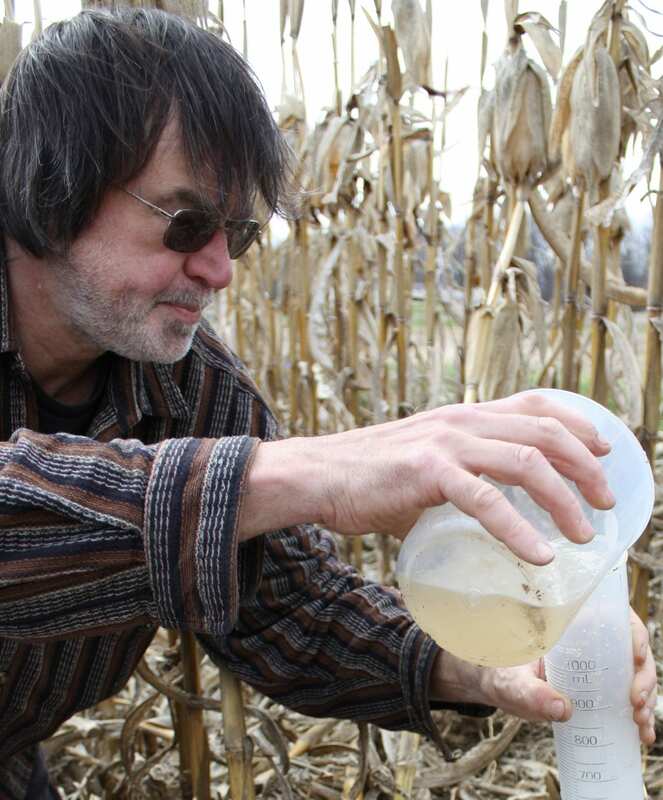 Bob coordinates the Cornell Soil Health Laboratory operations and development. 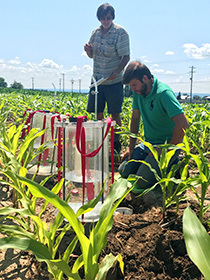 Bob has been part of the Cornell Soil Health Team’s development of soil management strategies to address laboratory-measured soil constraints. He has produced numerous peer reviewed and extension articles and has delivered over 200 presentations related to tillage, soil compaction and soil quality at farmer twilight meetings and professional conferences. Research activities are related to the measurement and understanding of soil physical responses to management including tillage, cropping, and applied organics. Research at long term (20+ year) agronomic field experiments provides a basis for understanding the multiple levels of effects of soil management on soil quality and crop response. The interactive effects of tillage and compaction on soil physical processes are brought to an educational focus through presentations which support a holistic approach to understanding soil functional behavior. Extension presentations feature combining comprehensive soil health testing with generalized soil management options to allow for farmer- and field- specific adaptive management strategies to be developed for sustainable soil management. Bob has co-developed the Cornell Sprinkle Infiltrometer which is used in the field to investigate in-situ water infiltrability. It can also be used in the field or laboratory to quantify soil wet aggregate stability. Bob teaches Introduction to Agricultural Machinery at Cornell University. Bob has developed and presented modules on soil physical processes and soil health assessment to various graduate and undergraduate classes in Crop and Soil Sciences, Horticulture and Agricultural Sciences. Field laboratory exercises demonstrate the utility of the Cornell Soil Health laboratory assessments to quantify soil parameters. Students learn of the interactive nature of soil processes towards developing a holistic agroecosystem management strategy. Bob is also involved in producing soils workshops and workshop modules to soil professionals, crop consultants and Extension personnel. Schindelbeck, R.R., van Es, H.M. 2010. Understanding and managing your soil using the Cornell Soil Health Test. Blair, R.J.; Lee, T.H. ; Pretorius, I.S. (eds). Proceedings of the fourteenth Conference, 3-8 July 2010, Adelaide, SA: Australian Wine Industry Technical Conference Inc., Adelaide, SA: 63-65. Idowu, O.J., van Es, H.M., Abawi, G.S., Wolfe, D.W., Schindelbeck, R.R., Moebius-Clune, B.N. and Gugino, B.K. 2009. Use of an integrative soil health test for evaluation of soil management impacts. Renewable Agriculture and Food Systems, 24:214-224. Gugino, B.K., O.J. Idowu, R.R. Schindelbeck, H.M. van Es, B.N. Moebius-Clune, D.W. Wolfe, J.E. Thies, and G.S. Abawi. 2009. Cornell Soil Health Assessment Training Manual, Edition 2.0. Cornell University, Geneva, NY. Schindelbeck, R.R., H.M. van Es , G.S. Abawi, D.W. Wolfe, T. L. Whitlow, B.K. Gugino, O.J. Idowu, and B.N. Moebius. 2008. Integrated Assessment of Soil Quality for Landscape and Urban Management. Landscape and Urban Planning 88, pp.73-80. O.J. Idowu, H.M. van Es, G.S. Abawi, D.W. Wolfe, J.I. Ball, B.K. Gugino, B.N. Moebius, R.R. Schindelbeck and A.V. Bilgili. 2007. Farmer-Oriented Assessment of Soil Quality using Field, Laboratory, and VNIR Spectroscopy Methods. Plant & Soil 307:243-253. Bianca N. Moebius, Harold M. van Es, Omololu John Idowu, Robert R. Schindelbeck, Daniel J. Clune, David Wolfe, George Abawi, Janice Thies, Beth Gugino, Robert Lucey. 2008. Long-Term Effects of Harvesting of Maize Residue and Tillage on Soil Quality. Soil Science Society of America Journal 72:960-969. B.N. Moebius, H.M. van Es, R.R. Schindelbeck, O.J. Idowu, J.E. Thies, D. J. Clune. 2007. Evaluation of Laboratory-Measured Soil Physical Properties as Indicators of Soil Quality. Soil Science Vol. 172, No. 11, pp. 895-910. Wunsch, M.J., R.R. Schindelbeck, H.M. van Es, and G.C. Bergstrom. 2007. Distribution, impact, and soil environment of Phoma sclerotioides in Northeastern U.S. alfalfa fields. Plant Dis. 91:1293-1304. H.M. van Es, J.M. Sogbedji, and R.R. Schindelbeck. 2006. Nitrate Leaching under Maize and Grass as Affected by Manure Application Timing and Soil Type. J. Environmental Quality Vol. 35, No. 2, pp. 670-679.